Creativity has no limits if you give it a chance. Just take a look at all the things from your house that are about to hit the dumpster and think if they can be refurbished. What if you could do something useful and decorative with them? Many people have dedicated their spare time to this amazing life hacks that are not the proof of our amazing capacity of creating but also a way to feel happy about the things we can do with our bare hands. You will only need a little patience and maybe a few bucks for glue or tape and you will be able to redecorate the whole apartment. Just grab the last tennis ball you bought for your dog and make a slice on it. It can be used to hold mail, pens, bags or even your keys. 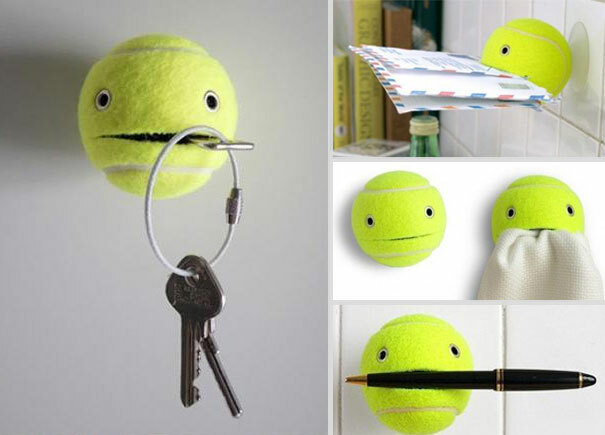 You can add two little eyes and make a tennis face. 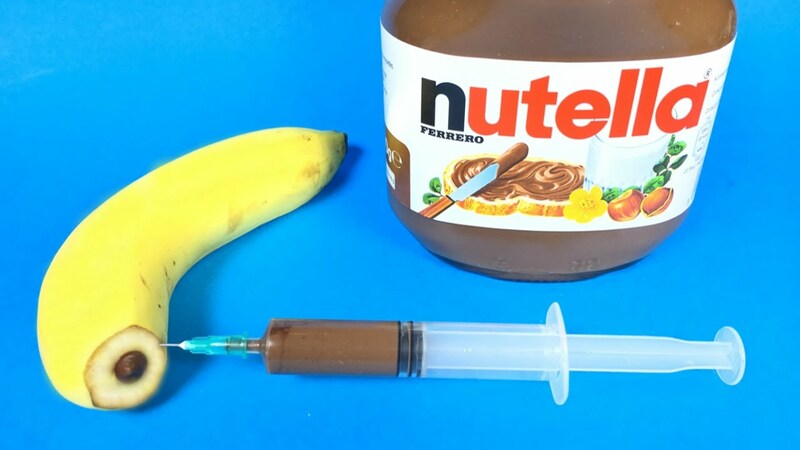 You only need a banana, a syringe, a jar of Nutella and voila. Make a hole in the fruit and refill it with this sweet taste from Heaven. You won’t regret it. Are you tired of a phone that never has signal? Why don’t you give a try to this clip antenna that could help improve the reach of your signal forever? Every time you try to squeeze a lemon you end up with your hand wet and smelly. Even your eyes are covered with lemon juice and your glass is still empty. The best solution? A pair of tweezers. Are you tired of being the stupid adult that gets all the hands sticky after eating a popsicle? Your days of desperation and anger have come to an end, my friend! Every time you have to unplug or move a wire you spend half an hour trying to figure out which one belongs to what. 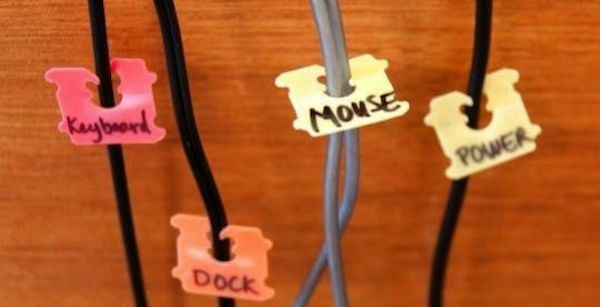 What if you use this bread clips to label them? 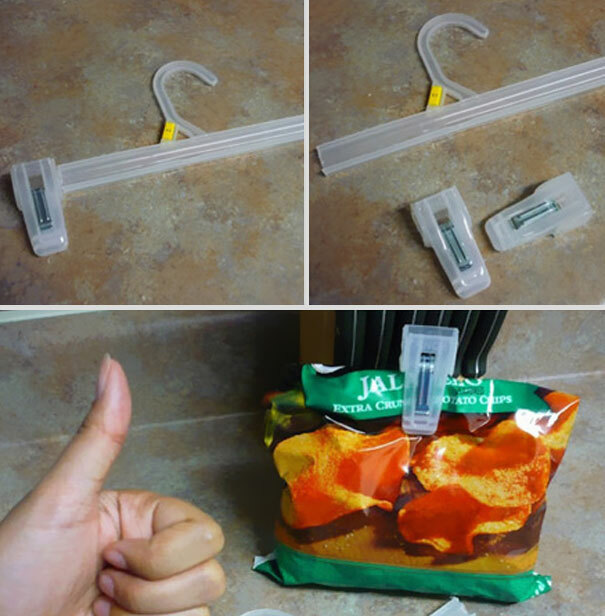 You will need a few hangers from your closet and voila, you’re welcome for this snack hero that will save all your food from humidity and bugs until you decide to eat them. Any time you open a new carton of milk or juice it is impossible to serve without spilling some of its content all over the table. The best solution comes with the help of a needle. 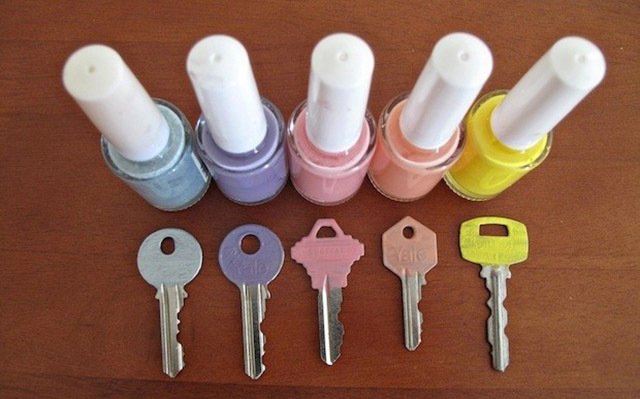 You will only need a set of different fingernail polish and then you won’t have to guess which key belongs to what door anymore. Make sure to make a mark on each door too. 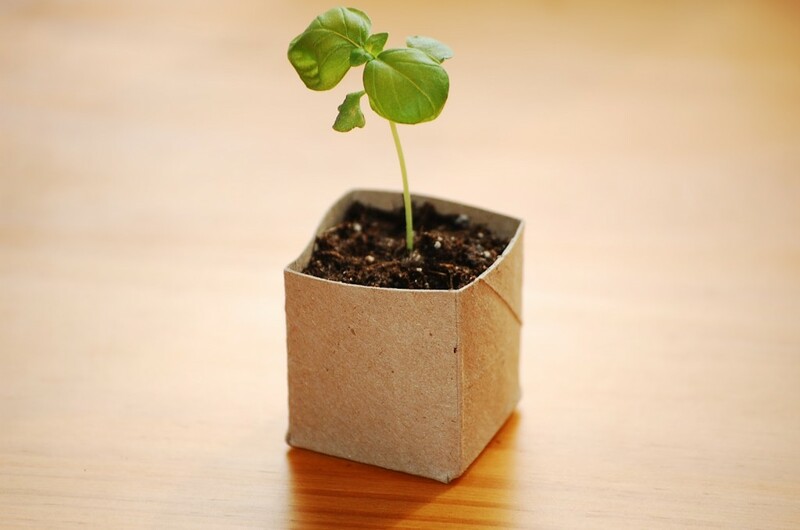 Take that paper towel cardboard roll and convert it into a nice starter pot. You can use it for bonsais or just for small plants till they can be put in the garden. When your old pair of socks has a hole in it you only need to get a marker that matches its color and paint that toenail that can be seen. Any time you unplug a device from your computer you don’t know what to do with that piece of wire with a pin in it. A set of this magnificent clips will save you forever. No one is too old for having some Legos in the house. In fact, you can justify the purchase by using them as cable holders for your computer or cell phone. Next time you buy a bottle of juice or milk, don’t throw away the recipient. You can cut it and use it as a pencil holder for you and your children. You will only need two cans of soda and a paper towel roll in order to create the ultimate sound system. The best thing is that you can take to all the parties you are invited to. 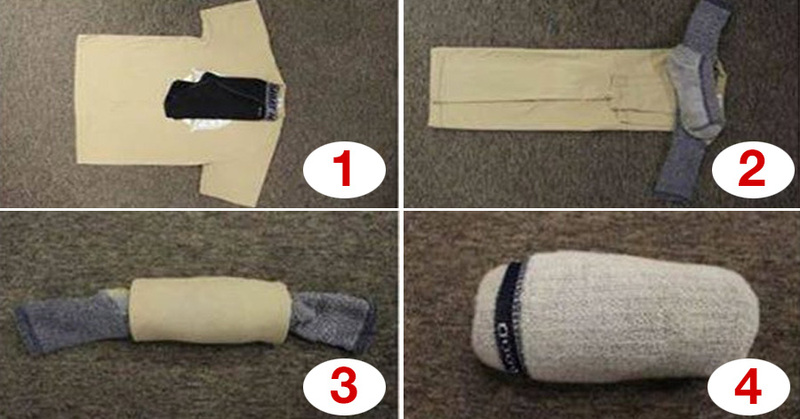 Next time you go on vacation be sure to separate your clothes like this in order to use better your luggage space. With practice, you will become better at this. Are you tired of having to stop in the middle of the street because of a broken flip-flop? 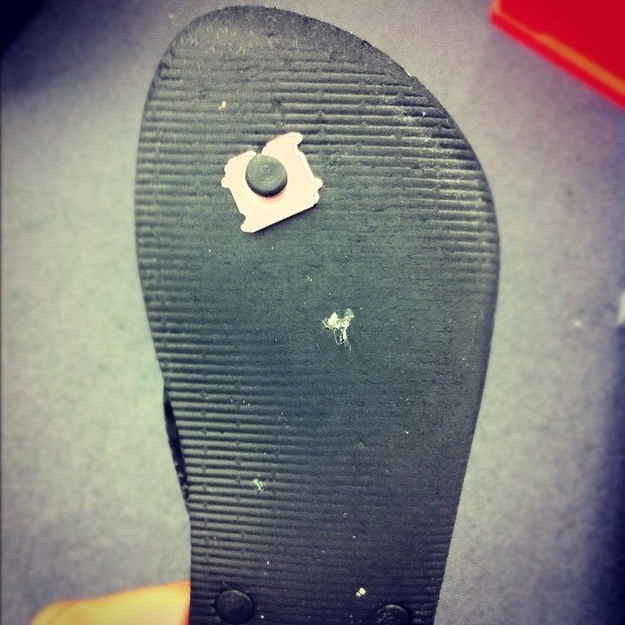 The best way to save is with a bread clip or just a nail that can hold that. So, you don’t have money for the cans of soda. Don’t worry. You can still have your own sound system with that paper towel roll and a few pins to hold it. For those binge-watchers that can’t leave their computers thanks to that addictive series, here’s the best solution in order to keep a healthy hygiene. Take a bag, put your phone in it and TAKE A SHOWER! Next time you go on a car trip and you don’t want to get lost but also you are aware of safe driving, here’s the best solution for a nice phone/GPS holder. Need to mix your food but you don’t have money for a beater? Why don’t you just use the tools you have in the house for a nice cooking time? Best potato chips ever that had left its can as a spaghetti container. I’m not sure how happy the kids from that house must be, but you don’t play with a Pringles lover’s heart. I’m not sure if it is a good decision to give you ideas for your next exam, but the one who did this has an incredible creativity. Cheating is really really bad, though! So your parents didn’t get you a microwave when you moved out for college? Well, here you have a great solution in order to heat up all your meals, like this slice of pizza. Are you still keeping some old CDs in a case like this one? The best use for that old plastic case is to turn it into the best bagel tote for the next time you need to take lunch to work. Barbeques can be an expensive item for your house, so instead of spending lots of money on it, you can use your rake for making a tasty meal for you and your friends. 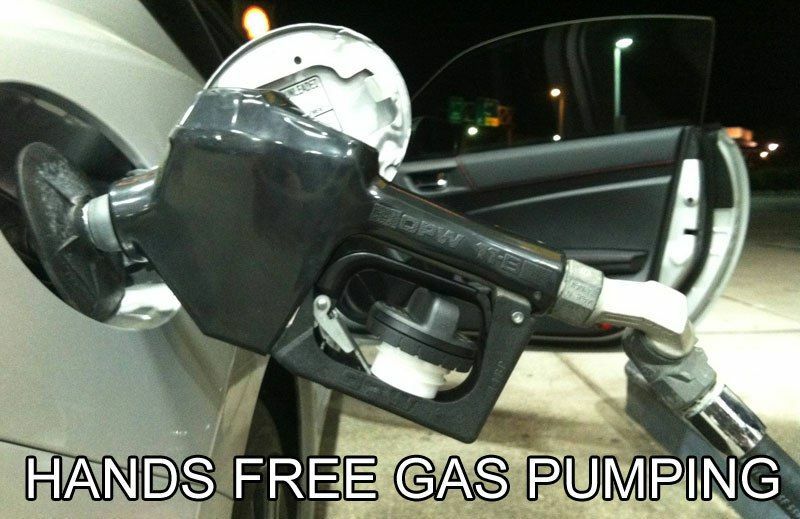 Next time you need to refill your car’s tank and you don’t want to stay out in the cold for a very long time you can do this. Just be sure to not overfill it. So you have a small kitchen and you are tired of looking for space in the house for a comfy cooking time. Well here you have the best solution for that problem. You aren’t the kind of person that does the dishes after every meal and you mother complaints about this all the time? All you need is a printed picture of the clean sink! Another great idea for the binge watchers in this website. Just take an old hoodie and fill it with popcorn. You will never need to get up from that chair again. When you have an old piece of furniture but you love it very much, you can save its image by rubbing a walnut on it and make it look as good as new. So you don’t have a corkscrew? That is not an issue. You can use a little nail and you hammer in order to create your own corkscrew and be baptized as the heir of McGyver. 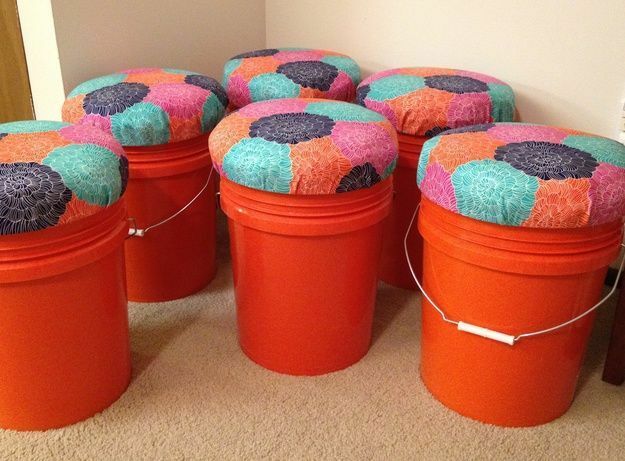 Just take your old paint containers, paint them all with the same color, buy a few cushions and you will have the best stools ever. They will even have handles! Don’t spend extra money in a safe that a thief might force you to open. Just get a nice socket like this one and hide all your precious stuff in there. Instead of making a sound system you could only create a nice set of speakers. You will only need two cardboard cups and your favorite earpiece in order to create this. If you are prepared, next time you have an emergency it won’t get boring. Be sure to have a nice variety of games and you will enjoy every visit to the bathroom. 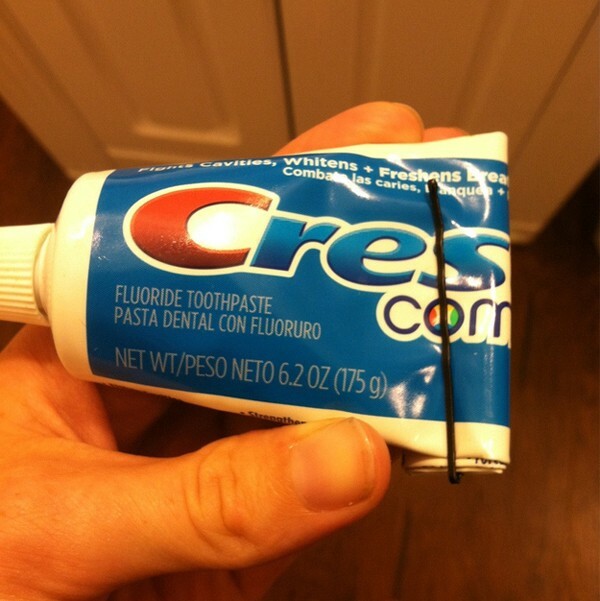 In order to use every drop of toothpaste, you should take a hairpin to squeeze the tube. This way you will not pay extra cents for things you don’t use. Next time you need to paint a room of the house and you don’t want to leave a stain on the floor, be sure to follow this piece of advice. I promise you won’t regret it. 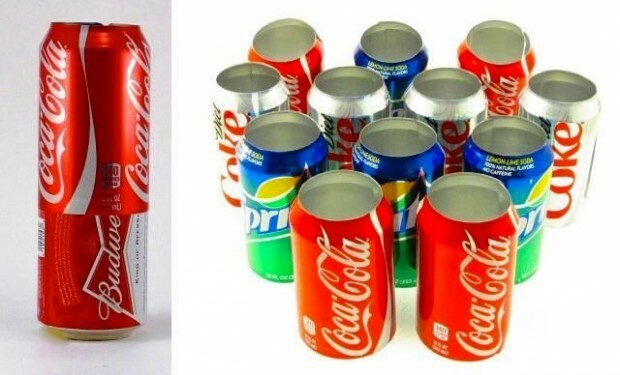 Next time you buy a can of soda you won’t break that piece and throw it away. It is the best straw holder and I’m sure you didn’t know about this. We are all living in the 2018 and this kid is in 2050. The best way to fool your teachers and use the phone in class without being told on. This is the best way to assure yourself that the next time you visit the bathroom you won’t be needing to shout to your wife to get more paper towel. Almost no one changes the shower from their houses after it gets a little old and water doesn’t come through its holes. But what if you could fix it with a can of soda? So the kid is giving you a hard time and doesn’t want to take his medicine? Why don’t you learn of this clever mother that fooled this kid with nothing but a can of Pepsi? Do you need space in your closet? So you need a little more space in your full of hangers closet? 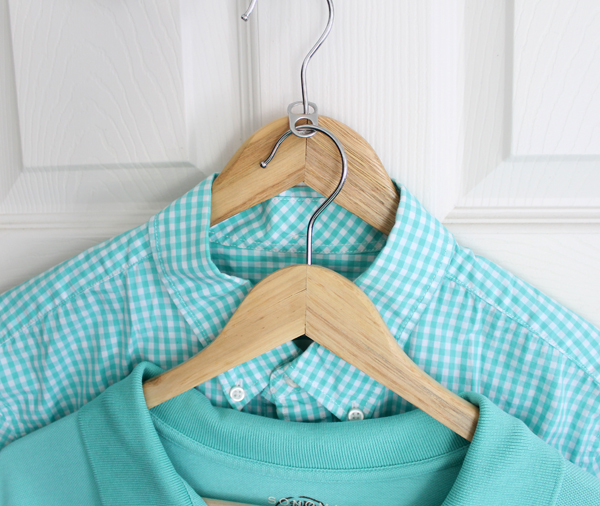 The solution is to use some soda tabs in order to hang some hangers of other hangers. So you like your bread toasted but not THAT toasted. Here you have a solution for your mysterious cooking taboos. Hope next time you cook for all your friends, dude! 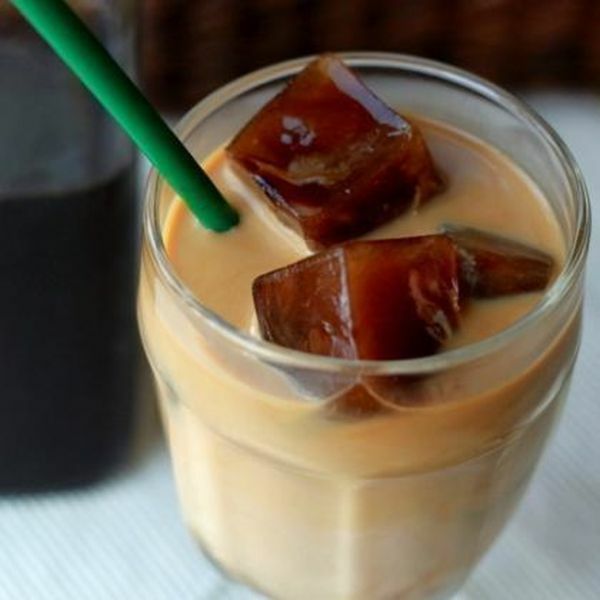 Next time you want to drink a really cold glass of cocoa, you will only need to freeze a few millimeters of this in your ice trays and you will have the greatest summer. Are you tired of those extension cords unplugging all the time? 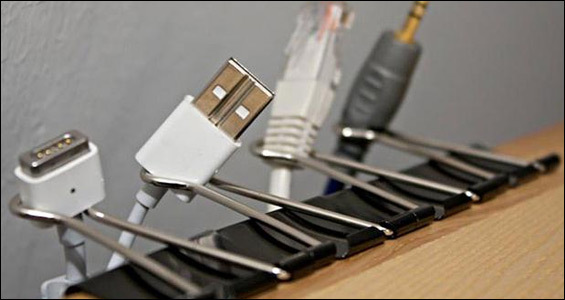 Well, here you have the best solution for your electricity problems: tie them together like this. You will never have the same problem. People are telling you all the time that you have a drinking problem? Here’s is the best proof that you have that issue really covered. How didn’t I think of this before? Your kid’s birthday is the day after tomorrow and you don’t have any money to buy him a gift. Here you have the perfect gift for him, made with your love and hands. The best way to keep your keyboard free of dust and dirt is by swiping it daily with the tip of a post it. It would help you remove all those cookies crumbs your father told you to.